Russian Buddhists are preparing to celebrate the Buddha's birthday: the day of his enlightenment and passing into Nirvana. At the Datsan Gunzechoinei in St. Petersburg, three days of prayers will be held beginning on May 25th. Russia's northernmost Buddhist temple is outwardly very different from the datsans in the traditional regions of Buddhism. But inside it is the same. The temple's prior, Buda Badmaev was the only religious representative in St. Petersburg to speak categorically against the deputy of St. Petersburg's Legislative Assembly, Vitaly Milonov, who proposed a ban on rallies outside places of worship. In his opinion, the Buddhist community should listen to and try to understand the position of any person publicly expressing dissatisfaction with their activity. 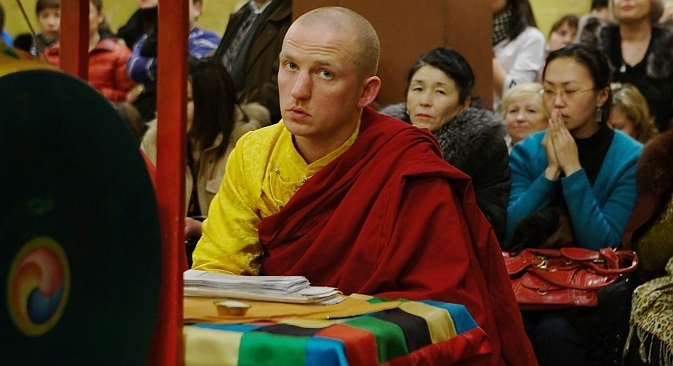 The Russian Buddhists are generally very peaceful; they try not to antagonize the authorities. Several years ago, the Ulan-Ude lamas proclaimed then President Dmitry Medvedev as the White Tara, a form of a major tantric meditation deity. The St. Petersburg Buddhists, for their part, prefer to keep to themselves and stay away from political life altogether. The St. Petersburg Datsan is unpretentious and democratic. You can come in, pray and walk out without as much as uttering a word. In modern Russia, Buddhism is historically represented by the Mahayana, or The Great Vehicle, branch. The Russian Sangha (community) observes eight major holidays. The Datsan is decorated on these festive days, and the lamas wear solemn robes. All eight holidays are marked by khural prayers and usually last for three days. The first day is devoted to reading excerpts from the Ganzhur, the 108-volume canon of the Buddha's teachings. The second day is reserved for service and the third to Sakhyuusan, a prayer to the Dharma protectors. The date of the Buddha's birthday changes every year following the lunar calendar. This year Russian Buddhists will pray for the Buddha on May 25. The St. Petersburg Buddhists do not ask authorities to block road traffic around the Datsan during traditional festivities. The community is not that large to be warranting such a measure. Besides, Buddhists generally prefer not to attract attention or inconvenience others in any way. The size of the Buddhist community in St. Petersburg may be small, certainly far smaller than that of the Orthodox Christian community, but it keeps growing. It's not that a lot of Kalmyk and Buryat Buddhists are flowing into the city. People born to traditionally Buddhist families are of course represented but the secret to the growing Sangha lies elsewhere. Many ethnic Russians come to Buddhism these days. People of Slavic ethnicity can be seen at the St. Petersburg Datsan regularly, and not only on the days of solemn events such as the Dugzhuuba ritual but also on ordinary weekdays, when even Buryat Buddhists seldom visit the temple. "What are this Buuz dish like?" the correspondent was asked by a Russian woman who decided, after prayer, to inspect the Datsan canteen located in the basement under the khural hall. On hearing that it is a traditional Buryat dish, a variety of steamed meat dumplings, the woman ordered a portion. In the temple lobby, a Russian family was browsing through an assortment of meditation beads put out for sale. Outside in the rain, a fair-haired man was circumambulating – circling clockwise around the temple. "There are indeed a lot of those who get brought here via the way of the head, i.e. via books and lectures," says the St. Petersburg Datsan press secretary, Alla Namsaraeva. "Perhaps this is due to the fact that Buddhism is not categorical. Our religion does not require people to convert from a different faith. A person may be [Orthodox] Christian but if they want to take part in a Buddhist ritual or visit a lecture nobody is going to say no to them." There are Buryats and Tuvins who can easily explain the meaning of each and every element of a prayer in religious terms. There are others, those who have a general perception of Buddhism and only follow the religion out of custom. Most Buryat families have a special place in their home for a Buddha statuette, to which they bring offerings of milk and candies. Many light up Tibetan incense before setting out on a journey. Although incense is formally recognized as a treatment for headaches and exhaustion, some Buddhists believe it also helps travelers in some way. Many traditional Buryat Buddhists have a rather patchy and utilitarian grasp on Buddhism. To them, it is something to stick to out of respect for their forefathers. The St. Petersburg Datsan, in a way, is a state in a state. The small land plot the temple stands on does not stop one from feeling the massive scale of the state which is Buddhism.